Casa Figueiras liegt auf einem großen, ruhigen & sehr privaten Teil eines Besitzes, ein rarer Fund im & um den Vale do Lobo. Es ist von einem Garten & Orangenhain umgeben. Der Pool ist groß (6 x 12m). Der Strand ist nur 5 min mit dem Auto entfernt. Die Villa, 1974 erbaut, ist gut erhalten. Sie hat 2 Terrassen, teils schattig. Das Wohn-& Esszimmer ist geräumig. Die portugiesisch geflieste Küche stammt aus 1974 und moderne Ausstattung wurde hinzugefügt. Alle 4 Twin-Schlafzimmer haben eine Klimaanlage. Alle Schlafzimmer haben angeschlossene Badezimmer: 2 mit Badewanne, Doppelwaschbecken & Toilette; 2 mit Dusche, Waschbecken & Toilette. Das Mobiliar des Hauses ist einfach. Es gibt eine Garage & ein Parkplatz für 3 Autos. Bettwäsche & Handtücher werden bereitgestellt, außer Strandtücher. Reinigungshilfe 2x/Woche, mit Bettwäschenwechsel. Mehr Hilfe ist gegen Aufpreis verfügbar. Der Besitz ist von einem Zaun mit Tor umgeben & ideal für Kleinkinder. Viel Platz zum verstecken & Spielen. Villa is fantastic and perfect for families with small children. Brilliant holiday! Stayed for 10 nights in August 2018 - 2 families with 3 small children. Villa was perfect - anything we needed was there & swimming pool in particular was amazing! Villa was spotless & cleaner came every 2 days which was great for changing towels etc. When we did encounter a small problem with the front door lock, this was resolved within 2/3 hours. Only slight negative is the location - there is no shop/restaurant/beach etc within easy walking distance. In the heat & with 3 children it was easier to drive or just stay at the villa which was fine with us!! It was great, like the previous years! We love this villa and surroundings, as well as the pool. We have been many years and will return next year. We love the house and come every year. The house is very spacious as are the grounds surrounding it- so wonderful for playing and running around and perfect for an afternoon snooze under the umbrella. The pool is massive- we can never seem to get our kids to come out. The large bedrooms have very comfortable beds (and big closets!) We also love the authenticity of the house- the Portuguese tiling and classic architecture. 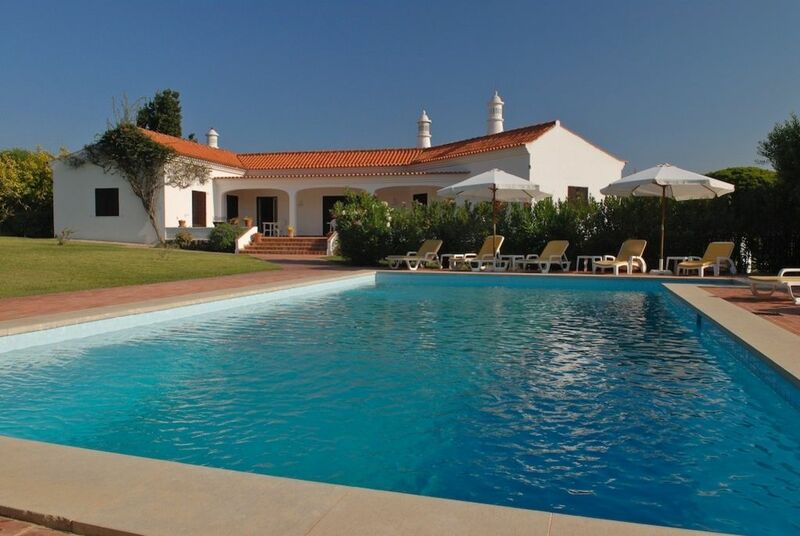 All in all we highly recommend Casa das Figueiras and can't wait to come back next summer! One remark. Walking to the beach with a twinbuggy is not so nice. It is about 25 minuts walking. It is goed to hire a bicycle and go by bike to the beach. Wonderful villa at an excellent and quiet location, close to the beach. The villa is well equiped and clean. A great lounge set on the terrace as well as a large diningtable and chairs. The property is stunning. Great pool. Lovely places around Amancil en great restaurants. Vale do Lobo in der Algarve liegt an der Südküste Portugals und ist bekannt für die schönen Strände und Golfplätze. Es ist nur 20 Minuten vom Internationalen Flughafen Faro entfernt. Removable swimming pool safety fence available at 200 Euro per week. Maid service is three times per week. Use of air-conditioning is included in the weekly rate. Security deposits of 350 Euro/British Pounds will be required and returned after villa has been inspected.